The crash of the Soviet Union left a lot of naval mines unused and left to rot. That is, until an Estonian artist called Mati Karman chanced upon. The artist that he is, Karman decided to use these discarded mines for a better purpose, designer furniture. Here are some of the more inspirational mine furniture designs from his collection that will definitely stand out in your home. 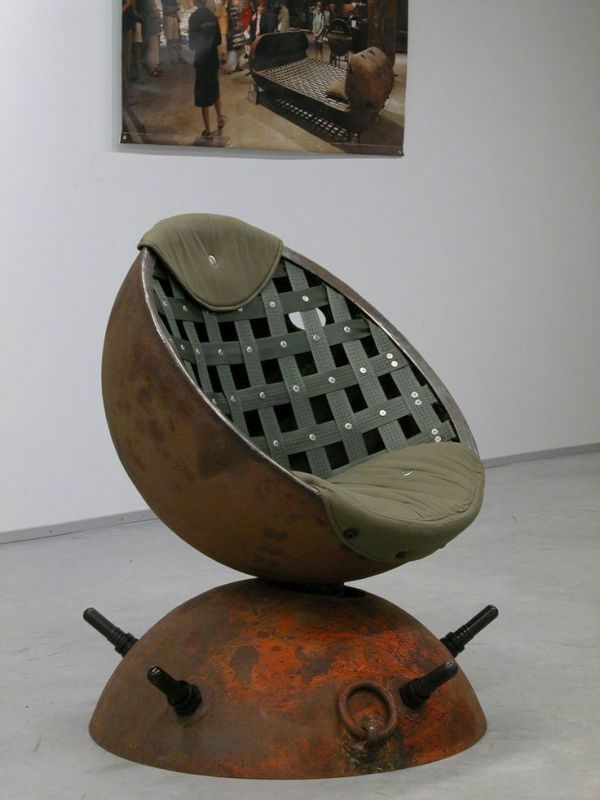 Fancy sitting in an armchair made of the remnants of a mine shell? The Poordtool-Retro is in fact, made of the two hemispheres of a recycled mine shell. The upper hemisphere has been upturned and transformed into a comfortable chair. It sits on the lower hemisphere and can be easily rotated with the help of a ball bearing in between. 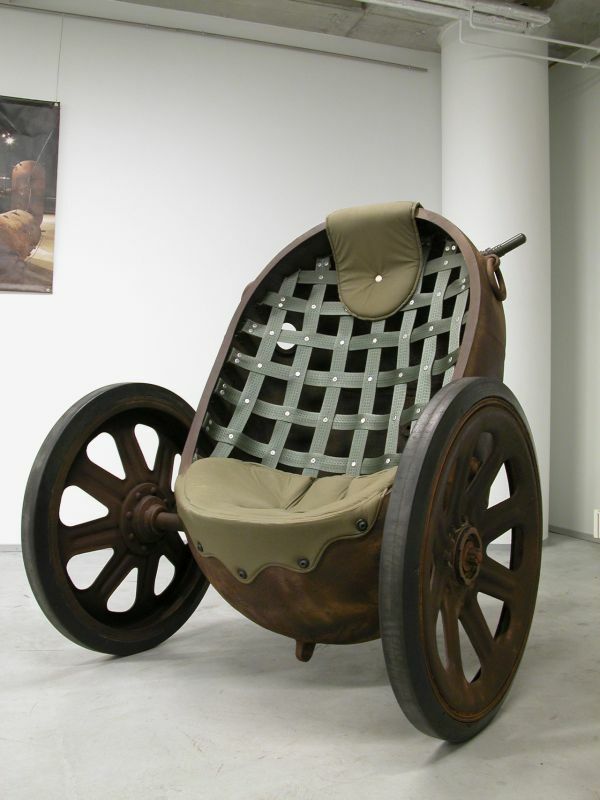 This classic military style armchair features a mine shell into which an elliptical hole is cut. Thickening and padding is provided with the help of a metal strip that is welded into the edge of this cut. The chair also features webbing made of caprone bands as well as a headrest and cushion made of canvas. This classic coffee table features a tabletop made of tempered glass sheet and polished edges. It is however, the bottom of the table that draws the viewer’s interest. The bottom of the coffee table features a min shell that has been cut in half lengthwise while the legs are made up of the steel mock-ups of the detonation horns. 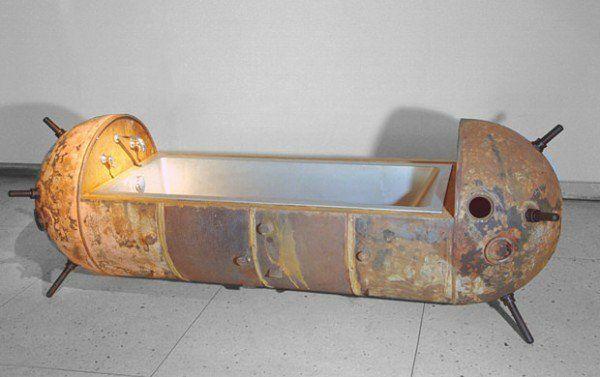 This unique looking bathtub has been made of recycled mine shells. A cylindrically cut piece of a mine shell is attached to two end mine shells on both sides. The legs of the bathtub are made up of the extended steel mock-ups of detonators, adding a rather military style effect to the entire design. 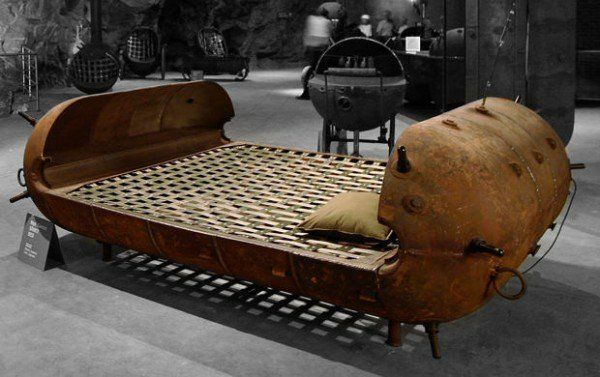 How about sleeping in a bed made from a recycled mine shell? Creepy? Well, we don’t think so. Take a look at this mine shell transformed bed that has been made from merged mine shells. While the outer casing may look tough and rough, the bottom of the bed features rather comfortable bedding made of caprone bands. 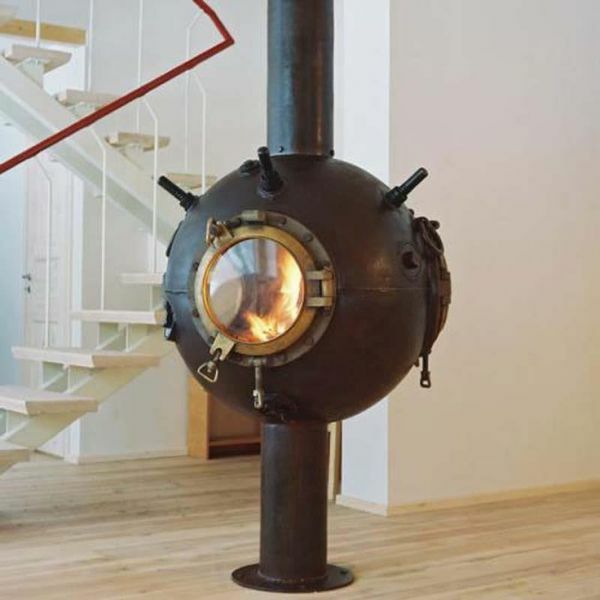 Consider this really cool looking fireplace that has been carved right out of a mine shell. The central part of the cylindrical mine shell has been completely removed, creating a cavity inside which in turn, makes the mine shell take on a perfectly spherical form outside. Another hole created on the outer surface acts as the door, and can be fitted with brass, bronze or heat resistant glass doors to create an authentic fireplace experience. 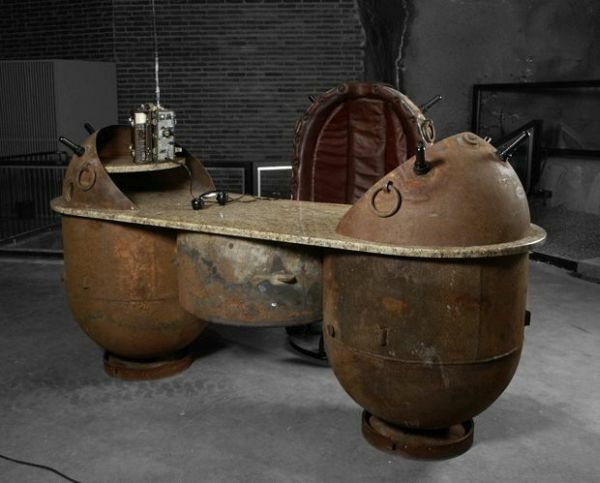 How about dining on a table that has been made from repurposed mine shells? The Davenport table features two complete mine shells that have been aligned symmetrically and vertically and rest on circle bases. A cylindrical mine shell forms the center piece between the two mine shells. A granite desktop completes the look along with vertically aligned mine shells on both sides of the table which act as drawers that can be opened and closed with the help of ball bearings. Show off a classic bar made of repurposed mine shells. 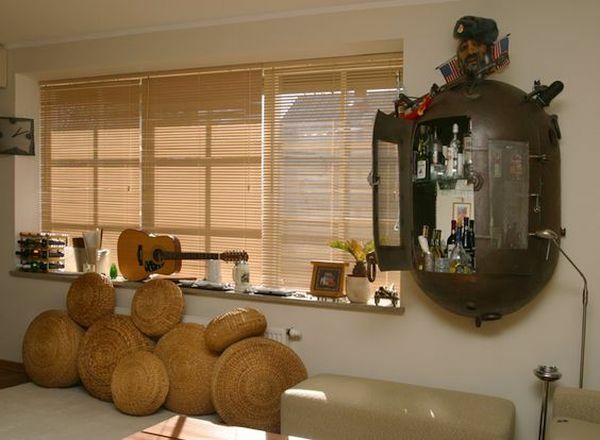 This classic military style bar cabinet comes with a cylindrical mine shell that has been cut vertically and attached to the wall. The doors of the bar cabinet are made of glass or metal net while the shelves inside the cabinet are made of metal, granite or glass. 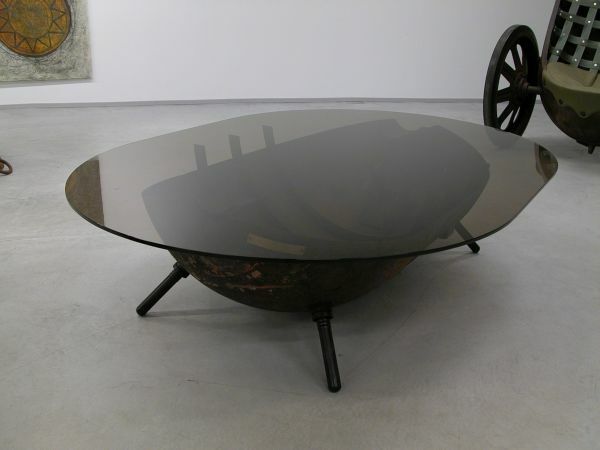 Estonian artist Mati Karman has come up with an interesting furniture collection made out of repurposed mine shells salvaged from deserted Soviet naval bases. The mine shells taken from these bases have been beautifully rearranged and designed to create interesting furniture designs that will look great in any home.